Running at speeds of up to 60 miles per hour, they are also North America’s fastest land mammals. One herd has been shown to undertake the continent’s second longest land migration (of up to 500 miles round-trip). Because they cover so much ground, and therefore require large areas of intact prairie, pronghorn are a strong indicator species, meaning that their reaction to influences like human activity can help scientists assess how other species might also be affected. 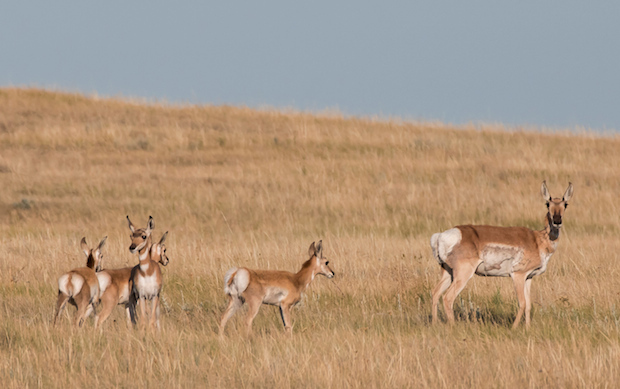 Studying pronghorn migration on the Great Plains contributes to a body of research about long-distance migrations, one of the most endangered wildlife phenomena worldwide. The annual pronghorn migration from northern Montana into southern Alberta and Saskatchewan and through American Prairie Reserve was found to be the longest distance migration of any land animal in the Lower 48. The project was conducted by World Wildlife Fund; Montana Fish, Wildlife & Parks; University of Calgary; Bureau of Land Management and the Saskatchewan Ministry of Environment. Specifically, the study focused on the ecological impact of human activities such as oil and gas development, roadway building, windmill development and other activities that lead to fragmentation of the pronghorn’s prairie habitat. Read the published research. Pronghorn numbers have plummeted in recent years due to severe winters, disease, and habitat fragmentation. Our work to acquire habitat that glues together public lands, while also removing fences that act as stressful barriers, will help improve the conservation status of pronghorn. Big sagebrush is a critical part of life on the prairie, especially when there isn’t much for wildlife like pronghorn to munch on above the snow. Despite being the fastest land mammal on the continent, pronghorn are constantly on the look out for threats.